The ensemble "Classical Weimar" reflects a period in history when this East German town was the cultural heart of Europe. 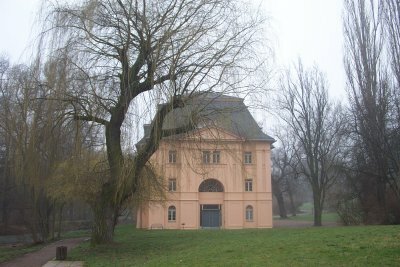 Goethe made Weimar his home in 1775, and Herder and Schiller followed his example. This was made possible by the patronage of (initially) Duchess Anna Amalia and (later) Duke Carl August. Entering the town by car, I noticed a sign displaying Weimar's city partnerships with Siena and Trier. It has picked its partners well, as Weimar turned out to be a pleasant surprise. The town sees about two millions visitor a year after the German unification. I visited it during Easter, and was certainly not the only one around. Although Weimar is quite small, it has enough on offer to entertain a visitor for a day or two. Its market square for example is one of the finest examples of a typical European square I have encountered. And then there are of course the number of elegant houses that belonged to prominent citizens like Goethe and Schiller. These famous artists are everywhere in Weimar, in the many book shops and on tacky souvenirs. The Park on the Ilm is a good destination for a Sunday morning walk. The main point of attraction here is Goethe's Garden House. The author obviously had thought well about its location, as the views from his house on the park are lovely. Weimar is a pretty town (and also has an element of a second WHS - Bauhaus - which makes it doubly as interesting). There are quite a few places within the town that are part of this WHS. There were two that were my favourites. The first is the House of Goethe, where I thought they had done an excellent job of presenting the atmosphere of the house during his time, combined with a great modern museum. The second place was the Wittumspalais which has a real sense of grandeur. It is a pleasure to explore and I spent a lot longer in there than I expected. For a city of its size (only about 60,000 people), Weimar has an unusually rich assortment of attractions due to its extremely important place in German history and culture. Goether, Schiller, Herder, Wieland and many others made it the cultural centre of the German enlightenment, Liszt and Wagner turned it into a centre of music, the Bauhaus group made it the centre of early 20th-century architecture and design, and the National Assembly proclaimed the first German republic there in 1919. For today's visitors, this means a large number of sites on a relatively small area that can all be easily visited on foot. From the sites constituing the Classical Weimar WH site, I visited Goethe's House, Schiller's House, the historic cemetery with the Prince's Tomb (including the tomb of Goethe and a tomb once thought to contain the remains of Schiller), the City Church (known as Herder Church), the City Castle and the Dowager's Palace (both just from the outside), and, as the absolute highlight, the Duchess Anna Amalia Library with its outstanding Rococo Hall (advance reservations required). I managed to see all of this in one day because most attractions are just a short walk from each other, but of course, one could easily spend several days there. 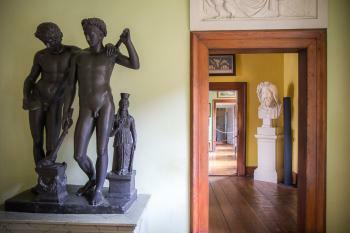 The monuments included in this sites embody the ideas conveyed during the classical Weimar period. This time witnessed the rise of geniuses such as Goethe, Herder or Schiller. 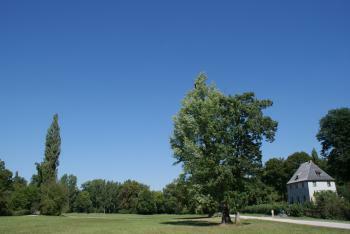 Goethe's house, the church and the Belvedere castle are particularly interesting. I visited this WHS in June 2013. Weimar's buildings are a joy to appreciate aestetically and walking around the city was very straightforward even without a map. There are UNESCO sign pointing towards all the different sites and there also is a UNESCO Platz close to Schiller's House!!! Apart from that though, all the buildings that are part of this WHS are within walking distance except for the Belvedere Castle. There is a tourist train that departs from the main city square every hour and it is well worth the effort. Not only is the castle interesting to visit but there are also less people around so at times I had the whole castle to myself! Another treasure trove was the Amalia Library. Unbelievably beautiful if you love libraries, but you have to go early in the morning (around 8-8:30) to make sure you'll buy one of the few tickets sold every day. Allow at least 2 days to visit Weimar otherwise it would be too rushed. It is difficult to say exactly what inspired me so much in Weimar. 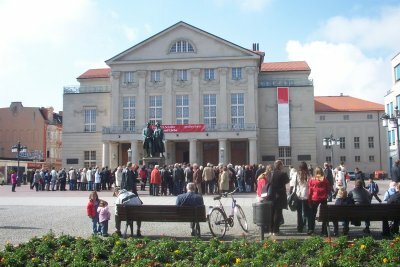 Surely the charming atmosphere of the city, for example at the beautiful theater square (with the Goethe-Schiller monument, the theater, and the Bauhaus museum) or at the Frauenplan with the Goethe House. Or it is the possibility to get a feeling for one of the most interesting periods in German history. Classical Weimar means the period between the end of the 18th and early 19th Century. Duchess Anna Amalia then invited four great humanists to Weimar, Goethe, Schiller, Wieland and Herder, and supported their work. The highlights, which should not be missed are the Goethe House, the Schiller House, the Anna Amalia Library and the park at the Ilm river. The Rococo Hall of the Anna Amalia Library has been restored after a fire in 2007. A visit is worthwhile, but the number of individual visitors is limited. However, it is possible to order tickets in advance. 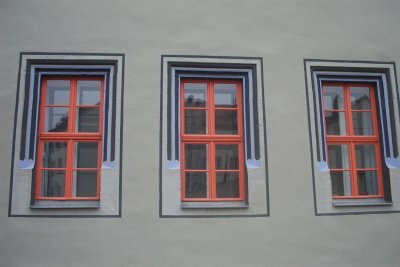 I went to Weimar in the summer of 2009. I also took a walk through the lovely Ilm Park and visited Goethes Gardenhouse (photo) and the Roman House. Other buildings that are part of the WHS are the City Palace, the Wittums Palace, the Herder Church and the Royal Crypt. All these places are within walking distance. 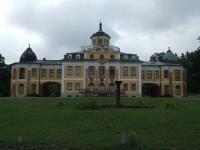 Outside Weimar, there are three castles with parks: Belvedere Castle, Tiefurt Castle and Castle Ettersburg. Of these, the Belvedere Castle is the most impressive. In the vicinity of the Ilm Park are also the three sites that belong to the Bauhaus WHS. I also visited the former concentration camp at Buchenwald, about 10 kilometers from Weimar. It was a strange experience to visit shortly after the other a monument of the most terrible time in Europe and places that represents humanism and enlightenment. Weimar impressed me on arrival. As I emerged from the railway station the classical stone architecture gave a feeling of style and permanence. The mood only improved as I reached the the town centre. Beyond the centre there are so many other interesting buildings to see: the royal tomb and its Russian church, the Roman House and Goethe's garden house in the park beside the river Ilm. Then the local buses took me further out, to the Belvedere palace, Tiefurt Palace and the Ettersburg Palace, as well as to the site of the infamous Buchenwald concentration camp. 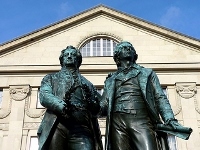 Classical Weimar is a unique world heritage as it represented the world of ideas during the enlighten age in Germany that influenced many works of German philosophers especially in this case - Goethe and Schiller. Apart from Goethe and Schiller Houses, which are very nice, I also visited the mausoleum of royal family which is not impressive at all, but my favorite is the landscape of the park an der Ilm which reputedly designed by Goethe. 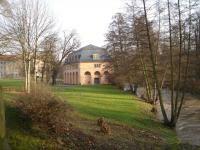 The park is really nice with many trees along the small Ilm river valley and Goethe's garden house was so cute. When I looked on the hill behide the garden house, I was so shock to find out that the modern Haus am Horn (another WHS) is almost in the same line with the simple old fashioned house of Goethe created a great one photo shot with two contrast WHS. Weimar is charming and has a lot of attractions for tourists, the food is also nice and the cost is still low compared to other German tourist places making a perfect destination for everyone. My Parents and I went to Weimar in 2001 on the way to the north of Germany. Although it was quite cold because it was autumn the town was lovely to look at. The sun was shining and we could sit outside drinking coffee. The house of Goethe was very interesting to look at because seeing all those pictures furniture and also instruments he used to experiment gave a good inside in what kind of person Goethe was. He was close to being an universal human being like Leonardo DaVinci. One very practical thing about Weimar is that it is not too big in terms of distances. You can walk just about everywhere and there are not only sights but also the lovely pedestrian zone with shops and cafes. Unfortunately we only had a few hours there but I am really looking forward to visiting Weimar again but this time it will be right in the focus of my trip. 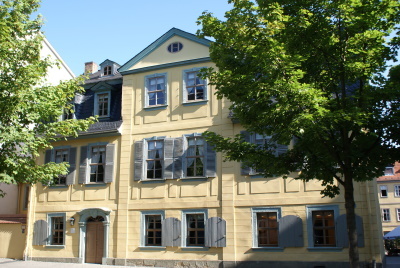 Built in the 18th century: Goethe's House (1709), Schiller's House (1777), Duchess Amalia Library (converted in 1766). Also - "It was during the lifetime of Duchess Anna Amalia (1739-1809) that its Classical period began." 208 Community Members have visited.